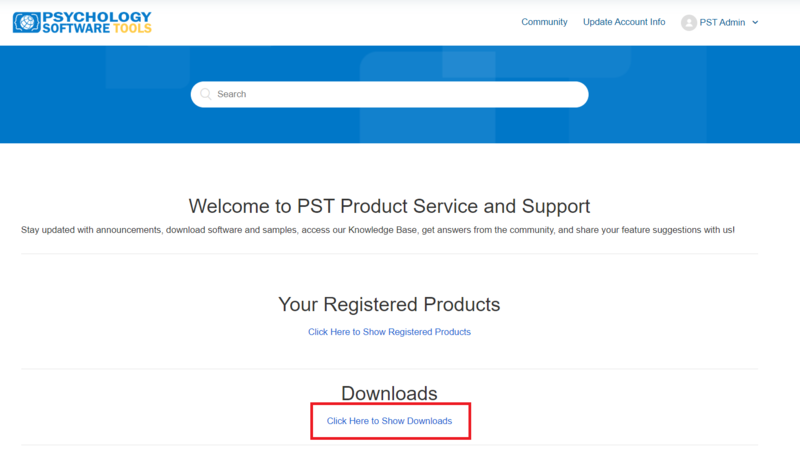 We host our Downloads at support.pstnet.com. However, users only have access to the downloads that they are registered for. You need to sign in or create an account and register your product specific (e.g., E-Prime 3.0, EEfMRI 3.0, etc.) Serial Number under the "Your Registered Products" section. This article acts as a step-by-step guide on how to accomplish this. Please enter all of your information in the appropriate sections while making sure that it is all correct. Then click the submit button at the bottom-left of the page. Once you have done this, your account is registered and you need to go to our Support Site to access your available downloads. You should be re-directed here automatically, but you can also get there using this link. On this page, start by looking towards the top-right corner of the page to see if you either need to Sign In or are already Signed In (Sign in would instead say your name). Once you confirm that you are Signed In, you first need to go to the large "Your Registered Products" area in the middle of the page and click the link "Click Here to Show Registered Products." Once you click in that area, there is an entry field to register your serial number. The About box in E-Studio. Hardware product serial numbers can be located on the devices. 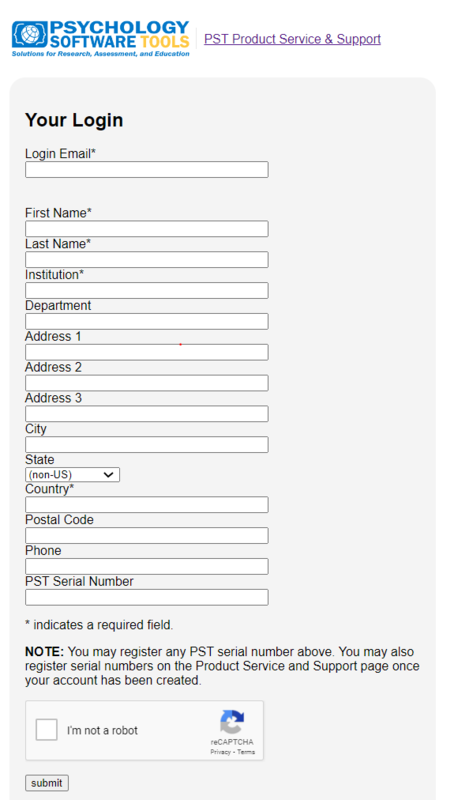 Simply input the serial number, make sure that it is entered correctly, and then click the Register button. Make sure to include the dashes ("-"). You will also be able to see if you have a valid support plan when viewing the registered serial numbers under the "Click Here to Show Registered Products" link. A valid support plan is required for all non-installation and PST Device requests. The support plans are explained in detail here: https://pstnet.com/products/e-prime/#product-tab-2. Support plans can be purchased through our online store: http://www.psychology-software-tools.mybigcommerce.com/software/support-plans/. Lastly, you need to go to the large "Downloads" area in the middle of the page just below the previous section and click the link "Click Here to Show Downloads". The products that you are registered for appear as available downloads in that area.